Yamaha NP12 Review - is this piano any good for your choice? Yamaha makes great keyboards. We know this. Everyone who knows instruments knows this. They don’t make cheap keyboards. Not usually. But that brings us to our Yamaha NP12 review. The Yamaha NP12 is a rare exception to that rule. This entry level board will not be for everyone. Buyers that have a little bit of experience are going to want a more intricate option. Budget buyers and beginners, however, are in luck. Is the Yamaha NP12 right for you? We can’t say. That is ultimately going to be for you to decide. We can, however, point you in the right direction. To do this, we now invite you to read on for our Yamaha NP12 review. The following paragraphs detail what we really like about the Yamaha NP12. A little bit later, we will look at the things we didn’t love so much. Ok. Price is technically a feature. It is a crucial consideration though. In fact, with this keyboard, it is probably the main consideration. 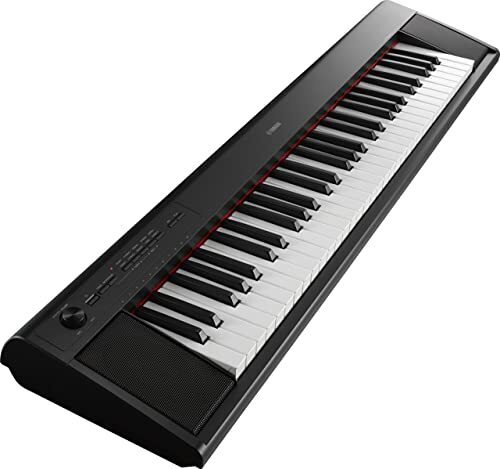 If you are looking at the Yamaha NP12, it is because you liked the price. And you should. Yamaha doesn’t really make keyboards that get much more affordable than this. Few companies do, in fact. If you are on a restrictive budget, you are going to find much to like here. The price makes it a perfect opportunity for beginners to get something that is reliable. This is the type of keyboard that you have to replace eventually as you get experience. Still, if you want a low-risk purchase as you start out, here it is. Portability is one of the main features that Yamaha advertises with the NP12. And it actually is quite portable. The board itself only weighs twelve pounds. It also features fairly user-friendly dimensions. Sized at just 46.9 x 14.1 x 7.7 in, this keyboard is certainly compact. Portability is usually a valuable factor for traveling musicians. However, traveling musicians probably aren’t going to go for this keyboard. It isn’t really gig-friendly. There is a utility to the small size though. This board does not come with a stand. You can purchase one for yourself, but they can get a little bit pricey. Because of the size though, you might not need a stand right away. The dimensions ensure that it will fit on a table, or desk. That way you can practice on it as you like, then move it out of the way when you are done. It’s also handy if you are in the position of needing to bring your own keyboard to lessons. It is also battery operated, which means that you can play anywhere that you like. If you have an IOS device, you are in luck. The board features an IOS port that allows you to connect your device to the keyboard. You can then use a corresponding application to make better use of the instrument. The app simply makes it easier to use the board. The interface is already fairly simple, but it is nice to be able to use an iPad as a display. To put it plainly, there are a lot of problems with this board. Not necessarily things that Yamaha did wrong. Just issues that crop up with any board in this price range. For one thing, you only get sixty-one keys here. The standard is 88. If you are just starting out, sixty-one might sound fine. In fact, it probably will be. For the initial stages of piano, many people only use a couple dozen notes. Eventually, though, you do grow out of that stage. When you start playing at a more advanced level, you need the full board. That means that if you take to the piano, you will need to replace this unit eventually. The keys also aren’t weighted. This is a big problem that you find in keyboards of this price range. In acoustic pianos, each key has a unique weight to it. As a result, the musician feels a small amount of resistance when they play the notes. Why does this matter? For one thing, going from weighted to unweighted can be tricky. Though you don’t own an acoustic, you should be able to play one. The unweighted keys complicate that a little bit. Weighted keys also just play a little bit better. Most musicians are more comfortable with them. The features are also quite scant. You get only eight voices, which isn’t a lot. For the price, that is somewhat to be expected but it is also a little bit disappointing. There is also an issue with the sound quality. The speakers are only so-so. For best results, you will probably need either headphones or an amp. If you are just using the board to practice, you might be ok. If you are hoping for some performance value, you don’t really get that here. Ultimately, the cons are all to be expected. There are reasons the board is as affordable as it is. You read the review, now it is decision-making time. So, what will it be? Yay or nay? With all of the information, we have seen it might be hard to decide. To help inform your decision, read on for a look at some pros and cons. There is no denying this board is basic. About as basic as Yamaha gets. Does that mean you shouldn’t go for it? No, not at all. It means a very specific type of person should go for it. To put it plainly, this keyboard is for people who aren’t sure about their future in piano. If you are just starting out, and don’t want to spend a lot of money, this is for you. The limitations of this simple instrument mean that experienced buyers will need to take a pass. Budding musicians, however, are in luck. The Yamaha NP12 offers an excellent opportunity to get a good product at an outstanding price.